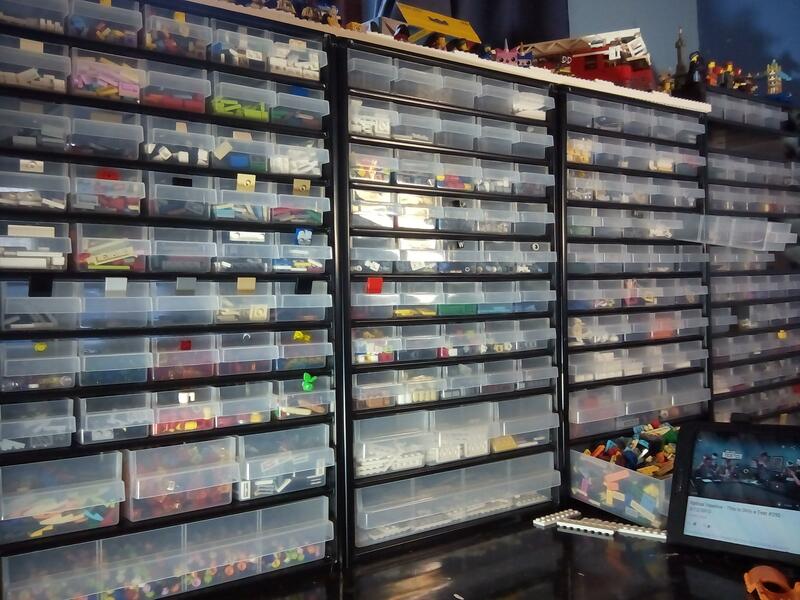 I am looking for a good Lego storage drawer/organizer. I know there have been many discussions on here about this and I have read them, but many times the links are dead or not specific to the UK. The drawers should be separated so they can't slide sideways. So does anybody have any advice or experience on which drawer system to use? Currently my favorite is the Draper one mentioned earlier, but it did get some bad reviews on amazon. I hope you guys can give me some advice. EDIT: Sorry about the bad formatting, fixed that. You are seeking the holy grail of storage which for many remains elusive. My own storage drawers about which I write in issue 2 of Bricks magazine are close to it but are no longer available and I don't have enough. I'd upload an image here but the option seems to have disappeared! Racco make some good ones, but they are metal and very expensive, being designed for industrial use. I noticed recently that Really Useful make a new storage tower system, for scrapbooking, http://www.reallyusefulproducts.co.uk/uk/html/onlineshop/rub_storage.php. It's larger than the usual ones you see (roughly A4 sized drawers) but crucially they also make a full depth 'hobby tray' that fits inside them, something they don't make for their normal sized ones. This divides the drawers into 15 quite large sections, which would suit basic bricks and plates and so I was thinking of buying some to expand my 'tier one' storage although their postage costs are expensive so I haven't taken the plunge yet. Thanks for your reply Huw! I am sad to hear that there appearently really isn't anything like this out there. Maybe somebody else found something? If anyone is thinking of buying really useful boxes there is a woman who sells them at a lot of the toy fairs particularly in the north but I'm sure she does London and Birmingham - they are all cheaper than I've seen them anywhere else, so worth a look. I have been using the taller 30-drawer draper cabinets, I have six or seven of them. They've worked out fine for me over the last 3y or so, although I'm now running out of space in them. no back and "fiddly" metal surround means parts can fall down / get lost or stuck. Drawers can also stick if parts get lodged. This isn't really an issue unless you overfill. I don't tend to move mine but suspect this would be an issue if I had to - not convinced parts would stay in. Hobby Craft stores often have them on offer; I bought two of the multi-coloured version for storing set instructions. Not on offer through the website; I think they were £20 or £25 each when we bought them. As I think you've already found out, he Akro-Mils ( https://www.akro-mils.com/Products/Types/Portable-Small-Parts-Storage/Plastic-Cabinets ) cabinets seem to be the "go-to" solution if you live in North America; unfortunately they are hard to find in the UK, and when you do they are massively over-priced. I've got a couple of the Draper ones you linked to above; they are available in quite a few places, and they are the closest I've found to the Akro-Mils ones, but I haven't found a cheaper source of them. I use them for storing very small parts. You can get them in different sizes (I use a mix of 250cc/500cc/750cc/1000cc pots). They stack & work out at about 10p-15p per container. It isn't a particularly space efficient way to store the bricks unless you have a *lot* of bricks & the containers are mostly full. This 64 draw Akro-Mils unit is ~$40 in the US; that works out at ~£30 (with UK sales tax added). The reseller on Amazon.co.uk I was just looking at was selling it, with P&P, for ~£81(inc.tax). Ouch. Clas Olsen do the same drawers as those draper ones, for about £10. Personally I have 6 of those, 1 of another drawer system which I got from Maplin for £22, and then a load of RUBs/pound shop alternatives for the larger stuff. Thank you for your helpful comments everyone! cons: no back and "fiddly" metal surround means parts can fall down / get lost or stuck. bluemoose and luckyruss: The casings of the Draper capinets do look as if they fit the drawers tightly. Is it actually possible for parts to slip out of the drawers through the side or the back while they are inside the casing? I hope its not possible to push drawers through the back of the casing. I know about the cheap containers for stacking but I really want something that is easily accessible and does not require me to shuffle around boxed just for that one part. I will keep it in mind in case (when) my collection becomes to big. During my search on amazon I noticed the same thing. It is insane what the resellers are doing there. Clas Olsen do the same drawers as those draper ones, for about £10. Personally I have 6 of those, 1 of another drawer system which I got from Maplin for £22, and then a load of RUBs/pound shop alternatives for the larger stuff. As an indication of size, each drawer in the 60-drawer unit can hold about 1,200 1x1 tiles. Each drawer comes with a divider. Thank you for pointing that one out. Are they stackable without problems? They seem to charge quite well for their delivery. The Raaco units Huw mentions are really good, I've fifteen of them in my study and they hold a decent amount of parts. They can be fairly expensive, but I've found ordering from an electronic component store, Farnell UK, can bring some decent prices. They don't interlock but they're deep enough to happily sit on top of each other, at least 2 units high. They can be screwed to the wall if you like. Delivery is quite high, hadn't really noticed before. Check to see if Big Dug are selling them on Amazon, delivery rates there can be cheaper. For a cheap way of making inserts into a larger drawer, I bought a load of business card boxes, like this (although they were £3 for 25 when I bought them). As each comes with a top and bottom, that gives you 50 plastic inserts that are removable. So long as you are not prone to spilling when taking them out or putting them back, they are great. @prophet05 I'm afraid they do tilt when stacked, yes. I have them stacked two high on my desk, which works fine, and any higher than that probably wouldn't be practical anyway. I got one of these last year, and it's great. Very heavy duty, can roll across the room if needed. You can also easily remove whole bins to bring them to your table. I've always favoured the metal drawer stacking box thingies but brick storage is so much easier if you use the plastic trays from advent calenders. There's an old picture inserted but the bricks fit in nice and neat. Plus I've gone ahead and bought a shoe rack so I can have two layers of trays & 2x the amount of bricks in arms reach. @Paperballpark Thanks for the info! I bought myself two of them anyway. The only real downside to the is the open back and that the drawers a quite cheap and sometimes jam. @rdflego Thanks for the images! I will keep those in mind for the future. I use a load of these same organisers, but I got mine from Screwfix. Wickes prices are much better! I didn't realise they sold them as well. I like the removable bins, much easier to tip the parts out you need than try and grab them. Thanks for the tip, my next supply will be coming from Wickes! After Huw's (relatively) recent article on storage drawers I wound up looking forlornly at my unsorted parts bin again and scratching around for a good solution. I like the quality of Really Useful Boxes so focused on those and found these for what looked a good price on B&Q. The inserts alone on RUB's own website is £5 each so to get two of them and the box for £10 feels pretty good value. As for the size, the description of storage for baubles is a good gauge - I wasn't 100% sure though, but ordered two and having had them a couple of weeks now I can safely say it's a nice size. I wouldn't recommend them for smaller parts but certainly and bricks and larger plates its's pretty good for. The only major downside to them is it is trays stacked inside of boxes, rather than easy to open drawers, but as things are, that is probably better for my current situation as I have limited space and regularly need to move stuff around. I'm still figuring out the details of how I'm organising various parts, but these have definitely made it easier. Having just been paid I thought I'd see if I can get some more and glad to see they are still only £10 each so put another order in. 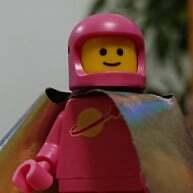 I've been looking at the 35l one for taking stuff to Bricktastic. 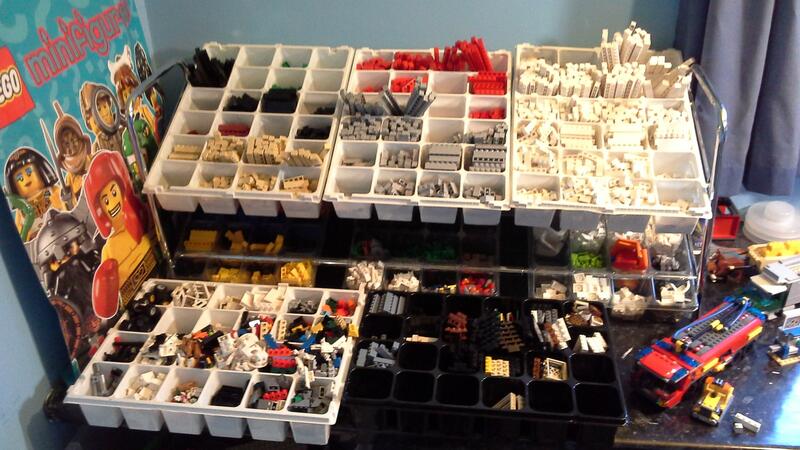 Can you fit a 48x48 baseplate, flat, in it? The measurements suggest it might just fit. Aldi has storage drawers on sale this week in the US for $8, so I picked up 10 of the 33-drawer version. Overall dimensions of the cabinet are 12" x 5.3" x 16.3". The drawers don't have much of a tab on the back to keep them from falling out, bit the dividers are nicer than what comes with comparable Akro-Mils drawers.